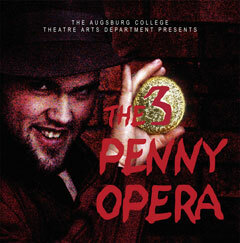 Tickets reservations are now being taken for Bertolt Brecht’s "The Threepenny Opera" with music by Kurt Weill. The musical satire is set in London and follows the stories of beggars, criminals, prostitutes, and constables. Having debuted in 1928, it is Brecht’s first and most celebrated success and introduced the “Epic” theatre tradition, which demanded the audience’s intellectual involvement. “While highly entertaining, it’s also a musical with deep and important meaning,” says director Darcey Engen. “In this political climate, it’s time to start looking at theatre as an opportunity for social change.” Music direction is provided by Sonja Thompson. Performances are April 13, 14, 19, 20, and 21 at 7 p.m. and April 15 and 22 at 2 p.m. in the Tjorhom-Nelson Theater in Foss Center. Call 612-330-1257 to reserve your tickets. Admission is $12 for general public, $10 for ACTC faculty, staff, and students, and $3 for Augsburg students.